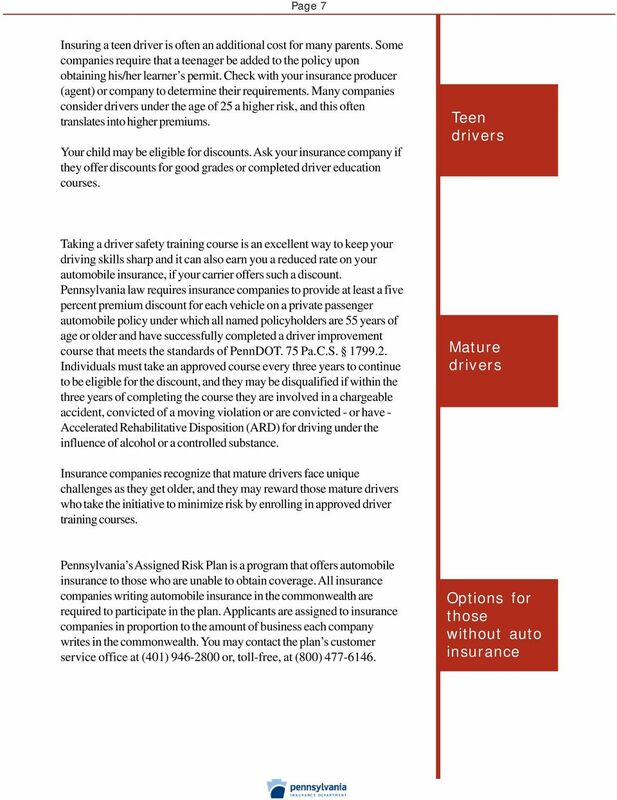 3 Page 2 Drivers must purchase and maintain car insurance in order to legally drive in Pennsylvania. Under Pennsylvania law, this is called maintaining financial responsibility on your vehicles. A lapse in insurance coverage may result in the suspension of your vehicle registration privilege for three months, unless the lapse of insurance was for a period of less than 31 days and the owner or registrant proves to the Department of Transportation (PennDOT) that the vehicle was not operated during this short lapse in coverage. If PennDOT determines that you operated your vehicle without the required insurance, your driver s license may be suspended for three months. 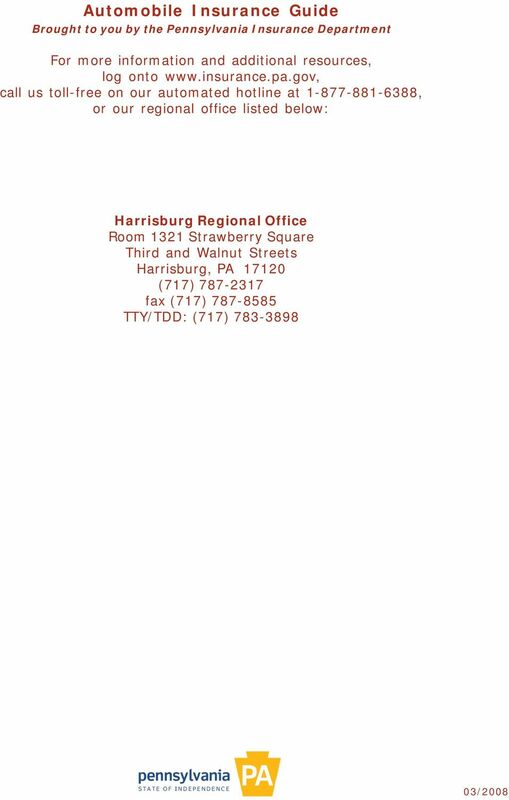 Also, your car s license plate, registration sticker and driver s license must be surrendered to PennDOT in order to serve the suspension. Restoration fees and proof of insurance must be submitted prior to having either registration or driving privileges returned. If you are stopped for a moving violation and it is determined that you are operating your vehicle without insurance, you could face the following penalties and expenses: A minimum of $300 fine for driving uninsured A three-month suspension of your vehicle registration A three-month suspension of your driver s license Restoration fees to restore your vehicle registration Restoration fees to restore your driver s license Vehicle impoundment In addition, your vehicle may not be driven by anyone while the registration is suspended. 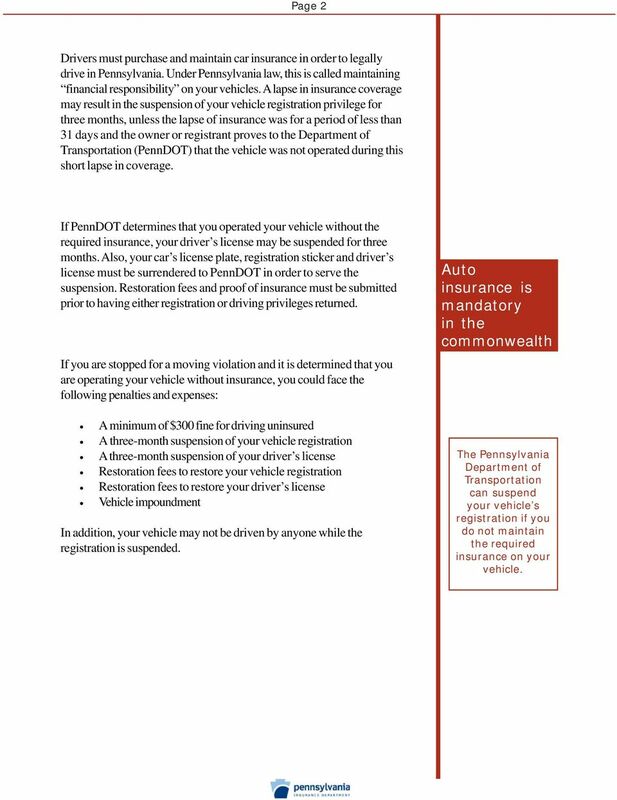 Auto insurance is mandatory in the commonwealth The Pennsylvania Department of Transportation can suspend your vehicle s registration if you do not maintain the required insurance on your vehicle. 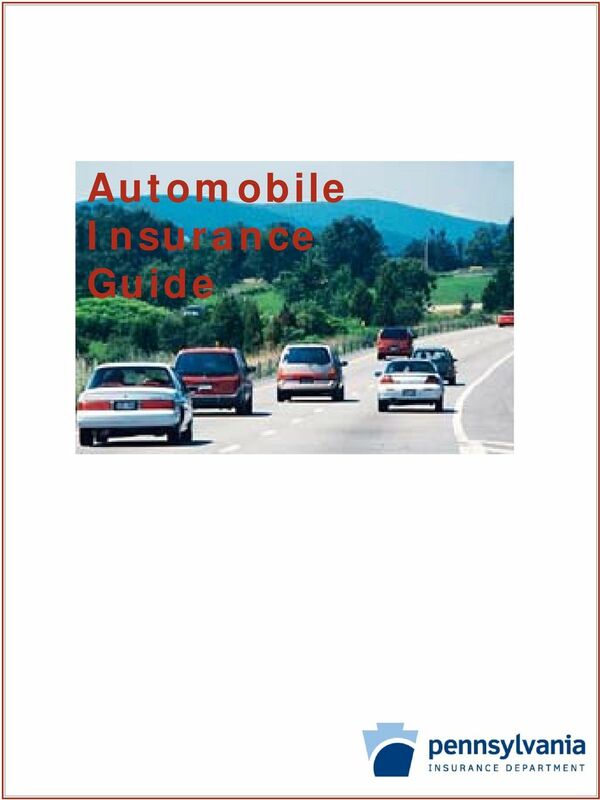 5 Page 4 Stacking of UM or UIM This coverage allows you to either multiply the amount of uninsured or underinsured motorist coverage by the number of vehicles on your policy or to receive uninsured or underinsured motorist coverage from more than one policy under which you are insured. It costs extra to stack uninsured or underinsured motorist coverage. Funeral Benefit This coverage pays, up to a certain dollar amount, money for funeral expenses if you or a family member dies as a result of an auto accident. Income Loss This coverage pays a portion of your lost wages when injuries sustained in an auto accident keep you from working. 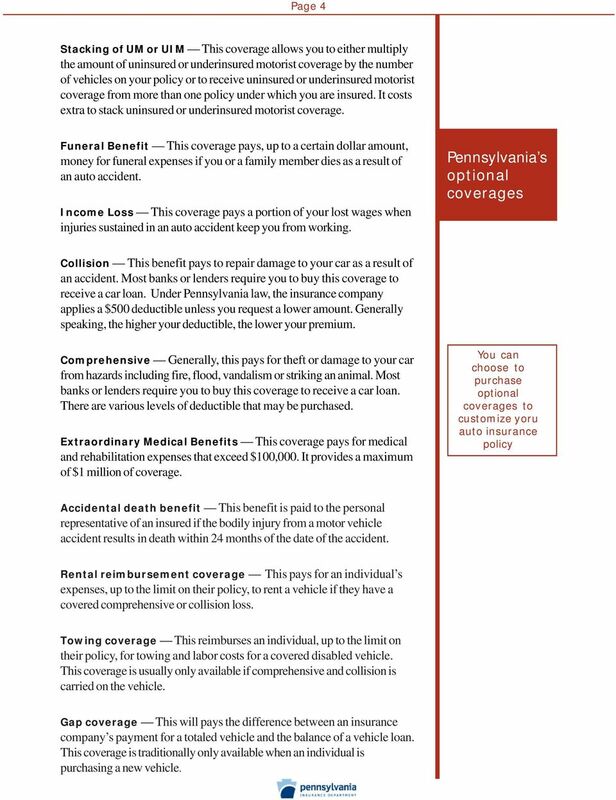 Pennsylvania s optional coverages Collision This benefit pays to repair damage to your car as a result of an accident. Most banks or lenders require you to buy this coverage to receive a car loan. 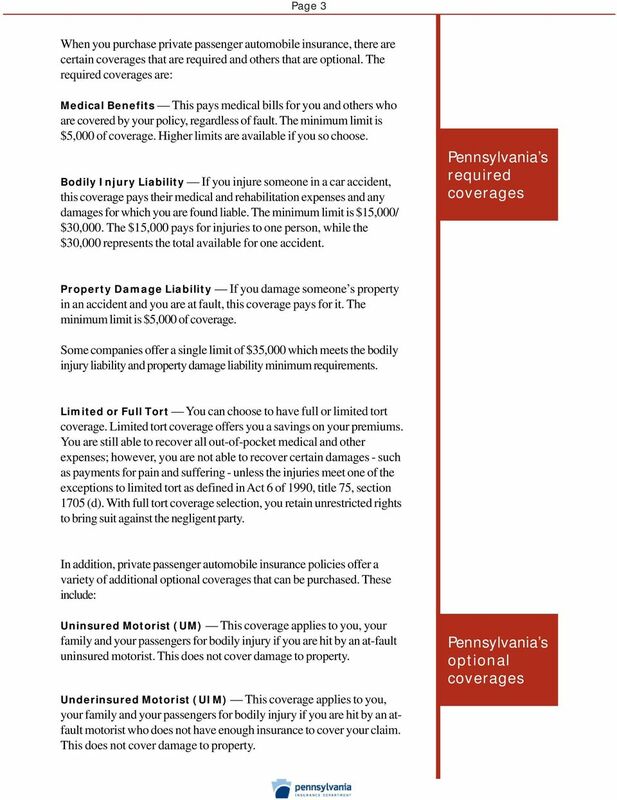 Under Pennsylvania law, the insurance company applies a $500 deductible unless you request a lower amount. Generally speaking, the higher your deductible, the lower your premium. Comprehensive Generally, this pays for theft or damage to your car from hazards including fire, flood, vandalism or striking an animal. Most banks or lenders require you to buy this coverage to receive a car loan. There are various levels of deductible that may be purchased. Extraordinary Medical Benefits This coverage pays for medical and rehabilitation expenses that exceed $100,000. It provides a maximum of $1 million of coverage. 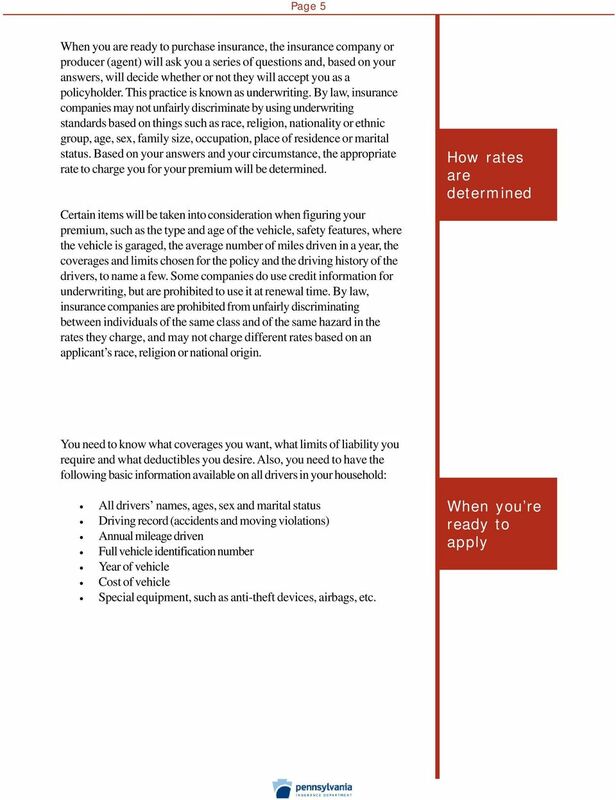 You can choose to purchase optional coverages to customize yoru auto insurance policy Accidental death benefit This benefit is paid to the personal representative of an insured if the bodily injury from a motor vehicle accident results in death within 24 months of the date of the accident. Rental reimbursement coverage This pays for an individual s expenses, up to the limit on their policy, to rent a vehicle if they have a covered comprehensive or collision loss. Towing coverage This reimburses an individual, up to the limit on their policy, for towing and labor costs for a covered disabled vehicle. This coverage is usually only available if comprehensive and collision is carried on the vehicle. Gap coverage This will pays the difference between an insurance company s payment for a totaled vehicle and the balance of a vehicle loan. 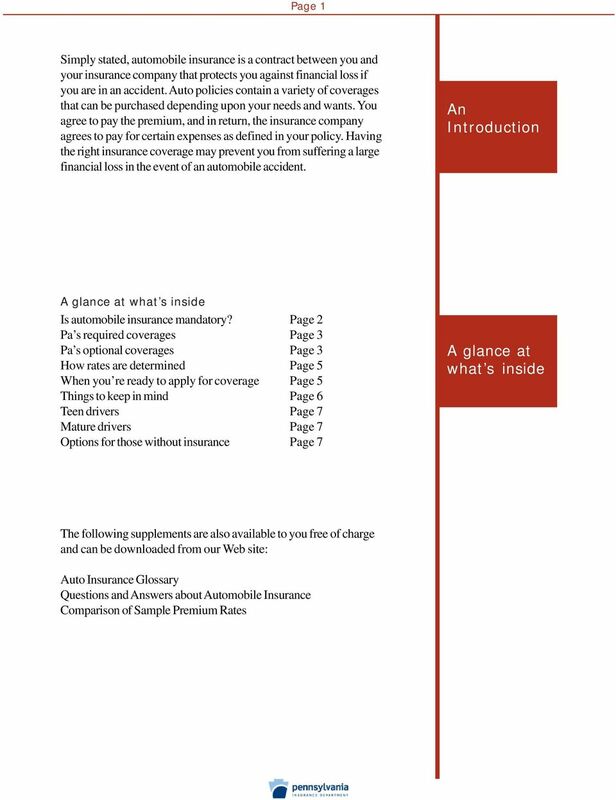 This coverage is traditionally only available when an individual is purchasing a new vehicle. 7 Page 6 Inquire about discounts (such as multiple policies with the same company, multiple vehicles, airbags, anti-theft device, etc.) and/or surcharges the company applies. Not all companies will offer the same type of plans or have the same underwriting rules (eligibility/ acceptability guidelines). Therefore, it is critical to ask for this information. Make sure you know the length of the policy term. Policies can be six months (semi-annual) or one year (annual), depending on the insurance company. 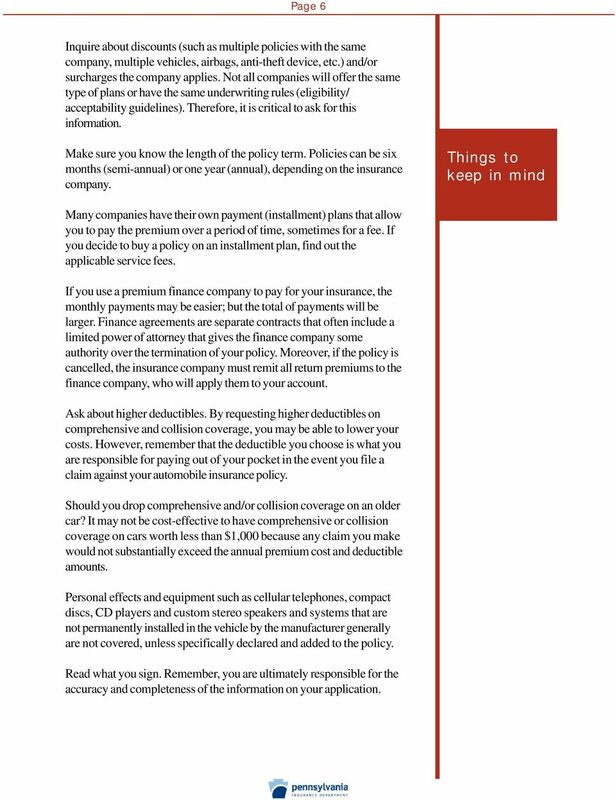 Things to keep in mind Many companies have their own payment (installment) plans that allow you to pay the premium over a period of time, sometimes for a fee. If you decide to buy a policy on an installment plan, find out the applicable service fees. If you use a premium finance company to pay for your insurance, the monthly payments may be easier; but the total of payments will be larger. Finance agreements are separate contracts that often include a limited power of attorney that gives the finance company some authority over the termination of your policy. Moreover, if the policy is cancelled, the insurance company must remit all return premiums to the finance company, who will apply them to your account. Ask about higher deductibles. By requesting higher deductibles on comprehensive and collision coverage, you may be able to lower your costs. However, remember that the deductible you choose is what you are responsible for paying out of your pocket in the event you file a claim against your automobile insurance policy. Should you drop comprehensive and/or collision coverage on an older car? It may not be cost-effective to have comprehensive or collision coverage on cars worth less than $1,000 because any claim you make would not substantially exceed the annual premium cost and deductible amounts. Personal effects and equipment such as cellular telephones, compact discs, CD players and custom stereo speakers and systems that are not permanently installed in the vehicle by the manufacturer generally are not covered, unless specifically declared and added to the policy. Read what you sign. Remember, you are ultimately responsible for the accuracy and completeness of the information on your application. 1. What types of damages could you cause while you are driving?